Everyone with a competition horse or pony with white socks knows the hard work it takes to get their white socks clean & white and then to try to keep their socks clean until the competition the next day. SocEm has been designed to be applied the night before competition so it will aid in keeping socks clean overnight and during travel. Socem comes in long lasting powder form which is mixed with water to make a smooth paste for application. 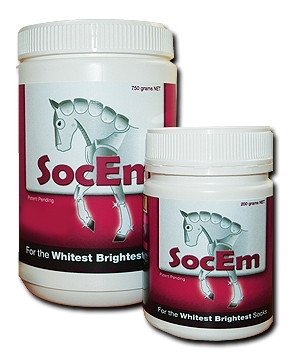 Once you have used SocEm, you will learn how much you need to mix for your individual horse. It is suitable for horses with clipped socks or natural unclipped socks.